The intended purpose of the rules for Freestyle Judo is to provide a safe and objective standard of criteria for the conduct of Freestyle Judo matches and tournaments. Judo is, among other things, a combat sport and the rules of Freestyle Judo reflect the original combat nature of Kodokan Judo. To insure objective and unbiased officiating points are assigned to a variety of skills. Every attempt has been made to provide a safe and objective atmosphere that reflects Kodokan Judo as the most technically advanced combat sport ever intvented. Please scroll down for the Freestyle Judo rules as amended to the AAU Judo rules and as recognized by the International Freestyle Judo Alliance. DECISION – Score more points than opponent at the end of schedule match time. OVERTIME – If no points are scored in scheduled match time, then a 1-minute overtime will be used for Juniors and Masters and 2 minutes for Seniors. The first contestant to score will win. If neither contestant scores an Ippon or points, then the referee and mat judges will declare the winner based on effective attacks. Ages 15 and older: Ippon can be scored by a throw, choke or armlock. Ages 11 to 14: Ippon can be scored by a throw, pin (25 seconds) or choke. Ages 10 and under: Ippon can be scored by a throw or pin (25 seconds). THROW – Throw opponent with control and force on back or back/side. ARMLOCK – Opponent taps out or referee stops the contest. CHOKE – Opponent taps out or referee stops the contest. PIN (Ages 14 and Under) – Hold opponent in Osaekomi for 25 seconds. THROW – Opponent lands on side or back in what would be Yuko in regular AAU rules. Note: The standard AAU judo rules will be enforced with the following exceptions and amendments for use in Freestyle Judo. Consult the current AAU Judo Rulebook for more clarification. The standard rules of judo as accepted and adopted by the AAU Judo Committee shall be enforced with the following exceptions and amendments as outlined in these articles. Freestyle Judo has two (2) categories, which are; 1-“Gi” Category where the contestants wear the standard judo uniform, and 2 -“No Gi” Category where contestants do not wear the standard judo uniform. The rules of Freestyle Judo as outlined in these articles apply to both the “gi” and “no gi” categories. The uniform and attire accepted for Freestyle Judo matches will be the following; (1) “Gi” Category, where the contestants wear the standard judo uniform as accepted by the AAU judo rules. (2) “No Gi” Category where the contestants shall be attired in standard judo pants to cover the legs (no shorts or other garment other than the accepted judo pants), regulation judo belt, a T-shirt, tank top, rash guard, body suit or other shirt (with short sleeves, no sleeves or long sleeves) covering the upper body. No shoes of any type are permitted. A contestant may wear any color uniform (judogi in the “gi” category, judo pants, or upper body covering in the “no gi” category) he or she wishes as long as it is not red. (A red judogi or uniform may cover a blood stain for purposes of hygiene.) Excessive patches that may prohibit an opponent from gaining a grip or grabbing the judo uniform are not permitted. The standard rules of AAU Judo for gripping, grip fighting and posture shall apply with the following amendments. 2: In the “gi” (and in cases where applicable, the “no gi”) category, the following amendments to the current standard AAU Judo Rules for Freestyle Judo when engaged in standing or “tachi waza” situations; (a) Holding or gripping the opponent’s belt (any part of the belt other than the portion that hangs from the knot) is permitted, with the exception of holding, grabbing or gripping the belt with the arm or arms straight or rigid in a defensive manner for more than three (5) five to seven (7) seconds without attacking the opponent. In other words, using the belt is permitted, but not in a passive or overly defensive manner. (b) Contestants are permitted to use the “pistol grip” hold on the opponent’s sleeve as long as it is not used as a passive or overly defensive measure in the opinion of the referee and judges. This grip is permitted as long as the contestant does not use it to avoid action with his opponent for three (3) to five (5) seconds without attacking the opponent. If the contestant is using this grip offensively, to attack his opponent or to transition to another grip, it is permitted. (c) The use of a “cross grip” is allowed. The “2 on 1” or “Russian tie-up” is permitted unless it is used as a measure to be passive or be overly defensive. Specifically, a contestant must make an attack or attempt to improve his grip or position within five (5) to seven (7) seconds after establishing a “2 on 1” or “Russian tie-up” grip. (d) Holding the opponent’s uniform or body with a grip holding the same side of his uniform or body is permitted unless used by the contestant as a measure to be passive or overly defensive. Specifically, a contestant must make an attack or attempt to improve his grip or position within five (5) to seven (7) seconds after establishing his initial grip. (e) The goal is to have the contestants in an upright posture so that both contestants can apply active offense and defense. If a contestant’s body bends forward in a passive or overly defensive posture with his/her shoulders forward and hips far away from the opponent for a period of five (5) to seven (7) seconds without attacking or attempting a technique, it is considered passivity and the appropriate warning or penalty shall be applied. (f) A contestant who backs directly away from his/her opponent in an attempt to avoid contact is considered passive and shall be warned or penalized. (g) A contestant may grab the opponent’s pants or pant leg in order to attack him; however, when grabbing the leg(s), pants or pant leg, the attack must be a continuous from the initial grab, hold or grip on the opponent’s jacket. Specifically, the attack must be a continuous movement and if a contestant grabs his opponent’s leg and places it between his legs to trap it (as in a single-leg takedown from wrestling), this is considered a pause in the continuous movement and not permitted. At this point, the referee shall call “matte” and any resulting throw or takedown shall not be scored as a valid throw or takedown. Grabbing the pants or pant leg to avoid combat or in a passive or overly defensive manner is not permitted. (h) A contest shall not attempt a throw or takedown technique unless he or she first grips or holds the opponent’s jacket with one or both hands. This must be an actual grip or hold and not merely touching the jacket as the throw or takedown is attempted. In “no gi” matches, the contest must actually grab or hold the opponent’s body or belt (from the waist up) before attempting a throw or takedown technique. This rule prohibits “shooting” for a takedown from a distance by an athlete who has not taken a grip or hold onto his or her opponent. (i) A contestant may grab the knot of his/her opponent’s belt (but not the portion of the belt hanging from the knot) when attempting a throw. (j) Situations not covered in these rule amendments shall be decided by the National AAU Judo Rules Committee. Note: The rules regarding gripping and grip fighting in Freestyle Judo are less strict than the current standard AAU Judo Rules, however the attacking athlete must initiate a grip or hold onto his opponent’s jacket (in “gi” matches) or onto the opponent’s body (from the waist up) before attempting a throw or takedown. The standard AAU Judo Rules will apply to groundfighting (newaza) situations with the following amendments and exceptions. 1: Active Groundfighting: Groundfighting (newaza) shall be permitted for as long as one, or both, contestants are actively working for a technique, to control the position or making progress toward that end in the opinion of the referee. The contestants must be active and attempting to control his/her opponent or attempt a technique. The referee shall allow both contestants adequate time to actively pursue groundfighting. The contestant must show progression toward a definitive technique with skill and progress to be considered attacking. The contestant must make an active attempt to turn the opponent onto the back, pass by his opponent’s legs in the guard position, sweep or roll the opponent over from the bottom while in the guard position, or secure a pin, choke or armlock where appropriate by age group. The contestant must show progress toward attempting or securing a scoring move. A contestant “riding” (for more than 5 to 7 seconds) an opponent (as in wrestling) without an attempt to turn the opponent onto the back and secure a technique is considered passivity and is subject to penalties. 2: Passive Groundfighting: Note: A contestant who lies flat on his front or is on his hands/arms and knees balled up and avoiding combat with his opponent for approximately ten (10) seconds, that contestant is considered passive and overly defensive. If a contestant is laying on his back with his opponent between his legs (in the guard position) and either crosses his legs or ankles together or in any way overtly is passive, stalls the action or is overly defensive and does not attempt to improve his position within at least 10 seconds, he is considered passive. An athlete actively defending himself is permitted, but an athlete who is passive and not attempting to improve his position is not permitted. Avoiding combat or passive or overly defensive behavior will result in possible penalties. If one contestant lies on his front, or positions himself on all fours or balled up tightly or, while on his back in the guard position as described previously to avoid groundfighting and is passive or overly defensive in the opinion of the referee, that contestant shall be assessed instruction, warning and penalties as listed later in Article 10. The referee shall verbally instruct the passive contestant with the command “Get active (color).” The referee shall allow the offending contestant to get active and if he/she does not within ten (10) seconds, the referee shall award an official warning to the offending contestant by saying “Warning (color) for passivity.” On the third offense, the referee shall assess a Chui (1-point penalty) by announcing “Chui, 1 point (color) for passivity.” The referee shall not stop the match or bring the contestants to their feet during this time. If the contestant continues to be passive and avoid combat by laying on his front side or balled up, the referee shall check with the two judges and assess Keikoku and award two (2) points to the other contestant, and ultimately Hansoku Make if the offending contestant continues to be passive and overly defensive. Note: The referee shall not stop the action to stand the contestants up to issue the official warning or penalties. A contestant shall be declared the winner in the same situations as used in the current AAU Judo Rules with the following amendments or exceptions. 1: Ippon. Ippon (Full Point) is awarded for a throw or submission technique. The accepted submission techniques are the same as used in the current AAU Judo Rules (armlocks and chokes/strangles). Ippon is not awarded for holding or pinning an opponent (Osaekomi) except in the Junior rules for ages 14 and under (see Article 12). 1: Throwing: When one contestant throws his/her opponent to the mat with control and force so that the contestant being thrown falls largely on the back or backside. The throw must be forceful and executed with control. The “rolling Ippon” where one contestant throws his/her opponent with control but minimal force will not be assessed as Ippon. (Note: If a thrown contestant lands in a “bridge” position (head and heels of the feet to the mat with the back arched), the referee shall award the score of Ippon. 2: Armlocks: Ippon will be assessed in the same way as done in the current AAU Judo Rules. 3: Chokes/Strangles: Ippon will be assessed in the same way as done in the current AAU Judo Rules. 4: Hold-downs (osaekomi waza) will not score Ippon except in matches for ages 14 years old and under. See Article 9, Assessment of Points that follow and Article 12 (Junior rules). Two (2) Points: A throw or takedown that would be considered Yuko in the current standard AAU Judo Rules. Four (4) Points: A hold-down (as accepted in the current standard rules of AAU Judo) for a time length of twenty (20) seconds. The assessment of penalties is the same as in the current AAU Judo Rules unless otherwise stated. All violations of rules that are applicable in the current AAU Judo Rules apply here in these amendments as well. 1: Hansoku Make (Disqualification); Same as in the current AAU Judo Rules. Official Warning: The referee shall issue a verbal official warning to one, or both, offending athletes for minor infractions (not infractions of the rules that would be assessed as a Keikoku or Hansoku Make in the current AAU Judo Rules.). The referee shall stop the match, turn to the offending contestant and verbally warn him/her, and if deemed necessary by the referee, explain why the verbal warning is being given. The referee shall not engage in conversation with the contestant or contestant’s coach. The referee shall quickly explain (if the referee chooses) the rule and continue the match without delay. Penalties are cumulative. Any rule infraction is an offense. The next offense does not have to be the same as the initial offense. Any rule infraction can be penalized. Some rule infractions are awarded an immediate Keikoku or Hansoku-make and are already addressed in the AAU Judo Rules. 2a: Immediate Penalty Assessment Equal to Keikoku: If the offending contestant violates the rules so that the initial penalty assessment would be an offense of a Keikoku (in the current standard AAU Judo Rules), the referee shall forego any verbal instruction, warning or caution and immediately assess a Keikoku to the offending contestant and award 2 points to the offending contestant’s opponent. The next penalty assessed to the offending contestant in this situation shall be Hansoku Make. If a contestant drives, spikes or “piledrives” an opponent onto the head or neck, the offending contestant will be penalized with a penalty of no less than Keikoku and, if in the opinion of the referee and two judges on the mat as sufficiently dangerous that serious injury might take place, Hansoku Make. 3: Unsportsmanlike Conduct and Prohibited Behavior. Any athlete who engages in unsportsmanlike behavior is subject to the penalties of the rules of judo. The referee has the discretion to assign penalties depending on the circumstances. This includes Hansoku-Make (disqualification of the athlete) if necessary. If an athlete is disqualified from a match, he or she may be also disqualified from the entire tournament or event, depending on the severity of the actions that led to the disqualification. The decision of the Head Official, tournament Director and 3 officials on the mat at the time of the disqualification must agree to the athlete’s disqualification from the tournament of event. Generally, disqualification from a match does not automatically disqualify the athlete from the entire tournament or event. In addition to the violations listed in the general AAU Judo Rules, the following situations and violations are listed for clarification. 3f: Coaches and matside. One (1) coach per athlete is allowed at matside. The coach must stay within the confines of the space provided for him at the corner or by the side of the mat. No more than 1 coach is permitted to call or signal instructions or advice to each athlete. The coach is to be properly attired in a clean shirt free of obscene wording or images, clean pants or shorts (of moderate length and not too short), which are not cut-offs or the coach may wear a judogi. The coach’s behavior must keep within the rules of AAU Judo. The coach’s behavior is subject to the same rules as the athletes on the mat. The referee has the authority to instruct an offensive coach to leave the matside, leave the immediate area or leave the gymnasium, area or room where the match is being conducted. A coach’s unsportsmanlike actions may result in the issuing or assigning of appropriate penalties to his or her athlete. A coach may be ordered to leave the tournament or event by the Head Official or Tournament (Event) Director for unsportsmanlike conduct or behavior. Anyone engaged in fighting or a physical confrontation in the area matside or in the gymnasium, area or room where the match or tournament (event) is conducted will be immediately ordered to leave the premises. 1: There shall be a referee and one or two mat judges for each match (two mat judges are preferred). The mat judges can move freely about the edge of the mat area to accommodate a better view of the action. The referee and judges may talk to each other (and to the officials at the score table or time keeper) as necessary to conduct the match. 2: The referee shall award scores and penalties and generally conduct the match. The referee may (and shall as necessary) talk to the athletes during the course of the match to conduct the match safely, fairly and effectively. 3: All Actions of the officials are based on the majority of the three (3) officials on the mat. In a situation where one or more of the mat officials has made an egregious error, the Head Official may intercede in the decision or conduct of the match. 4: Protests from coaches on a match or call during a match must be done immediately after the end of the disputed match. Only one (1) coach per athlete may file a protest. The protest must be filed with the Head Official or if there is no Head Official, the Tournament Director. 5: The referee and judges shall wear the designated AAU Official’s shirt, dark or neutral-colored athletic pants and socks. If possible, wear wristbands that correspond to the colors used on the scoreboard and the contestants’ belts. The referees shall be attired in such a way that brings credit to the sport of Judo. 1: Ages 11 and under; Ippon can be scored by a throw or hold-down. 2: Ages 11 to 14; Ippon can be scored by a throw, hold-down or choke/strangle. 3: Ages 15 and older; Ippon can be scored by a throw, choke/strangle or armlock. 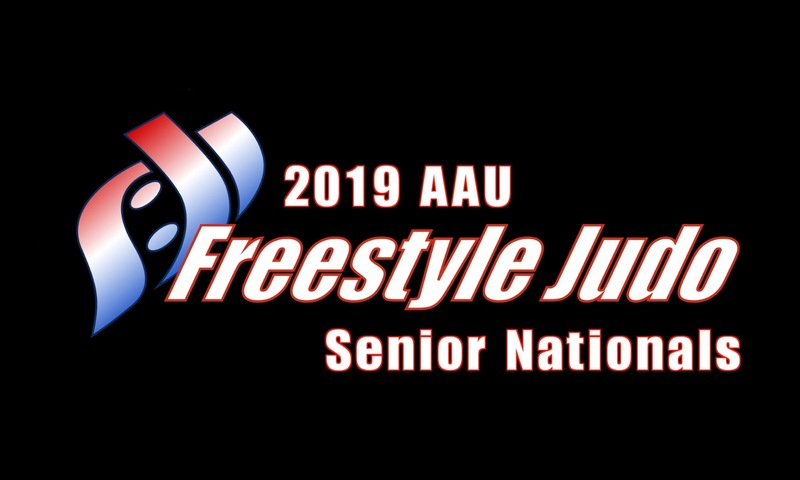 Note: For all contests for athletes ages 15 and older, the same rules governing Senior and Masters shall be in effect, unless otherwise designated by the National AAU Judo Chairman or Vice-Chairman or the event director (with the permission of the National AAU Judo Chairman). 6: Athletes in the 11 to 14 year old category may win on in newaza (groundfighting) by either osaekomi (pin) for 25 seconds or shime waza (choke/strangle). Athletes in this age group shall not use kansetsu waza (armlocks). 7: The minimum age that armlocks (kansetsu waza) is permitted is 15 years old. Both contestants must be a minimum of 15 years old. 8: Athletes who are a minimum age of 15 are permitted to use throws, hold-downs, chokes/strangles and armlocks. 2: If a contestant applies standing Guillotine (Hadaka Jime) or any choke/strangle or neck restraint and attempts a throwing technique or takedown technique on an opponent, the contestant attempting the technique will be penalized Hansoku Make (Disqualification). This is a dangerous situation and the possibility of neck or spine injury is a real possibility when attempting these types of techniques. 3: If a contestant applies a “Fall Down” Waki Gatame (Armpit Armlock) or any armlock where the opponent is taken to the mat without opportunity to tap out or submit, the offending contestant will be penalized Hansoku Make (Disqualification). The possibility of severe injury to the arm and shoulder is very real when attempting this type of technique. 4: If a contestant drives, spikes or “piledrives” an opponent onto the head or neck, the offending contestant will be penalized with a penalty of no less than Keikoku and, if in the opinion of the referee and two judges on the mat as dangerous, Hansoku Make. 5: Specifically, if a contestant attempts a choke/strangle or an armlock that permits his opponent the opportunity to tap out or signal surrender, it is allowed. An example of a technique that is allowed is the “Flying or Jumping” Juji Gatame (Cross-body Armlock). 6: A contestant shall not jump on an opponent’s back to secure a choke/strangle or armlock (or in any way take the opponent to the mat). The referee shall call “matte” in this situation. The offending contestant shall be subject to the hierarchy of penalties, with an appropriate instruction, warning and application of penalties by the referee as necessary. 1: The result of any technique started simultaneous with the time signal or the referee calling “matte” shall be ruled valid and scored as to its merit. 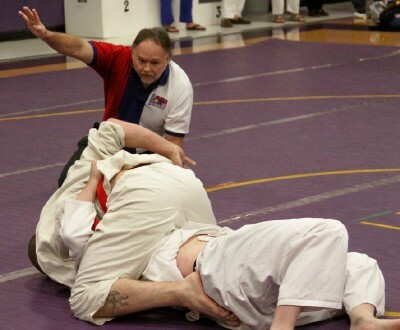 Specifically, if a contestant taps or signals submission simultaneously as the referee calls “matte” or when the time signal is sounded (or at the official cessation or end of the time of the match), the technique shall be ruled valid and the score of Ippon shall be declared to the contestant who secured the technique. 1: A throw or takedown shall be considered valid if the technique is started within the contest area. Specifically, if a contestant is thrown outside of the contest area, but the actions of the throw (or counter throw) are continuous and the entire sequence of action initially started within the boundaries of the contest area, the throw shall be considered valid and scored according to its merit. 2: If an osaekomi (hold-down) is secured by a contestant and his opponent moves outside of the contest area boundaries, the hold shall be considered valid and scored accordingly to its merit as long as the holding contestant has any part of his body within the contest area boundaries. Situations not included in these amendments and exceptions to the current AAU Judo Rules shall be decided by the National AAU Judo Rules Committee or National AAU Judo Chairman or Vice Chairman. For more information, contact Steve Scott at stevescottjudo@yahoo.com.